I recently read a tweet by someone who was concerned that between the Teen Titans Go! animated series, which has gotten a lot of negative feedback from fans for its overtly childish nature and kid-friendly tone, and the recent trailer for that dark and brooding Titans television series which was also met with huge online criticism (at one point, Robin just straight up says, “F**k Batman!”), it seemed like Warner Bros was deliberately trying to sabotage this section of the DC Universe so hard that it could never been seen as credible afterwards. While it certainly seems that DC is doubling down on the unnecessary bleakness with that upcoming live-action show, the backlash is a little more questionable when it comes to Teen Titans Go!, a show which was primarily made for much younger children not old enough to really appreciate the more adult and complex narratives surrounding these particular characters; in other words, it was never intended for the grown-up fans who were the ones complaining about it. I’ve not seen any episodes of the show in question, but from what I gather it seems to be an alright show for children, so why adult DC fans are up in arms over a show that never had them in mind to begin with is a real cause for debate. Nonetheless, Teen Titans Go! To The Movies, the feature spin-off of said cartoon series, has caused them to become even angrier that it’s this edition of the Teen Titans that’s the first to make it to the big screen and not, well, the actual Teen Titans themselves. Once again, the toxic entitled fandom surrounding DC can’t seem to appreciate that this movie, exactly like the show, was never made for them specifically, and the children that it was made for will have a pretty good time with this movie. There’s even a fair amount of humour that will please some of the more forgiving adults in the crowd, especially with how it pokes fun at not just the DC Extended Universe but also superhero movies in general, making it a rather amusing surprise that shouldn’t be entirely overlooked. In the film, as I imagine it is in the series, the Teen Titans consist of Robin (voiced by Scott Menville), Cyborg (Khary Payton), Beast Boy (Greg Cipes), Starfire (Hynden Walch) and Raven (Tara Strong). The team, and Robin in particular, is envious about every other superhero getting their own movie except them, and they become determined to be seen as real heroes so they can have one made about them. They decide that the way to do that is to gain an arch-nemesis, and as it so happens one comes strolling along in the form of Slade (Will Arnett), a villain who’s out to rule the world but not if Robin and his friends can help it. Immediately, you understand that the tone this movie is setting for itself is one that absolutely appeals most to young kids, which is identifiable through a lot of the silly dialogue, the bright and colourful animation, and the leniency towards fart and poop jokes. There’s a lot of that which continues throughout the whole movie, and if you’re anywhere between six or ten years old then you’ll be on board with it all just fine; for adults, I can certainly see it aggravating some people because some of it can be typically obnoxious for this kind of kid’s show nowadays, and I can also see others really having a good time with this film because, truth be told, it can be very funny at times – yes, even some of those fart and poop jokes get a giggle every now and then. Its strongest comedic moments are easily whenever it’s poking fun at the current superhero trend in Hollywood right now, especially DC’s own line of movies – there are background references to Henry Cavill’s CG’d-out moustache in Justice League, we see a callback to one of the most mocked moments of Batman v Superman: Dawn of Justice, and there’s even an acknowledgment that the 2011 Green Lantern movie was, well, absolutely rubbish (“we don’t talk about that,” as the Green Lantern in this movie glumly reveals) – and how there’s so many of them nowadays that even the most obscure heroes are being given the big-screen treatment, like the Challengers of the Unknown who I didn’t even know existed until they were brought up in this film. 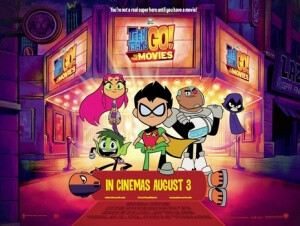 There’s also a killer montage which sees the Teen Titans go back in time to erase all of DC’s superheroes from existence, which involves some hilariously dark humour regarding some of the more famous origin stories (how they screw up – and then unscrew up – Batman’s origin is one of the biggest laughs I’ve had at a film all year so far). There’s a lot of comedy thrown at us here, but the good news is that most of it sticks and appeals to both children and adults who can easily find something to laugh at here, though I doubt most parents will be pleased with the very final line of the movie right before credits roll, which is hilarious and brilliantly timed but will certainly cause frustration from mothers and fathers everywhere. Everything else, from the characters to the story to the music and so forth, is typically childish and chaotic, but unlike a lot of other movies made primarily for children this one feels like it was written by people who genuinely wanted to entertain its audience instead of cynically pander to kids as a mere distraction for an hour and a half. The animation is colourful and expressive, the jokes are certainly spot on, and there’s a simple but sweet message at the heart of it all; it’s far from the absolute disaster many adult haters of the show were banking on, and while it certainly won’t appeal to everyone it’s a fun and surprisingly smart little movie that every kind of hero can enjoy. Teen Titans Go! To The Movies is a fun, colourful and surprisingly smart send-up of DC superhero movies, which is made stronger by its childish but often hilarious sense of humour which will have kids and adults laughing all throughout.